We support the Oxfordshire Blue Plaques Board and the Museum of Oxford. 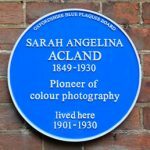 The Blue Plaques scheme commemorates people from all walks of life who have lived in Oxfordshire and made a significant contribution in their field. The Museum of Oxford is dedicated to telling the story of Oxford and its people.